Perennials are the workhorses of the garden: They return every year to anchor your flower beds or landscaping. They are reliable, always showing up at the same time in the same place with the same look. Annuals are the show ponies. They complete their entire lifecycle in a single year, but they pack a lot in, especially in terms of color and aroma. That makes them perfect for perking up your outdoor space. However, you need to choose your annuals carefully – both the type of flower and the individual plant. Amount of sun. Many annuals require full or mostly full sun for most of the day. These include popular flowers such as begonias, daisies, geraniums, lavender, petunias, marigolds, zinnias and phlox. A few – most notably impatiens, fucshia and coleus – thrive in the shade. Temperature. Make sure the plant you choose is appropriate for your area. If your weather is too cool or wet for the plant, it will not thrive. If your weather is too hot, it will get “leggy,” meaning the stems will get too long. What else you are planting. You want all the plants in your garden to work together to create a pleasing look. 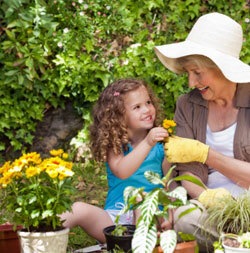 For example, choose shorter flowers for the edges of the garden, so that they don’t block plants on the inside. It also helps to have a color plan, whether you choose to mix and match colors or stick to a single palette. How the plants are displayed. Are the pots jammed together and left in the hot sun? Or are shade-loving plants such as impatiens kept under cover? What color are the plants? You want plants that have bright green leaves and look healthy. Avoid plants that look wilted, which can be a sign of too little water, or yellow, which can be a sign of overwatering. Is the pot big enough? If a plant is left too long in a pot that is too small, it can become root-bound, a condition in which the roots wind up among themselves and then will not spread out properly when you plant the flower in your garden. If a plant looks too big for the pot, and especially if there are roots coming through the hole in the bottom of the pot, the plant could be root-bound. Try pulling gently to remove the plant slightly from the pot. If all you see are large, tangled roots, look for another plant. Once you have chosen your plants, take them home and plant them in your garden. Follow the directions for watering and other care, and then sit back and enjoy.